Lots of work done today in the second weekend of terrain building. 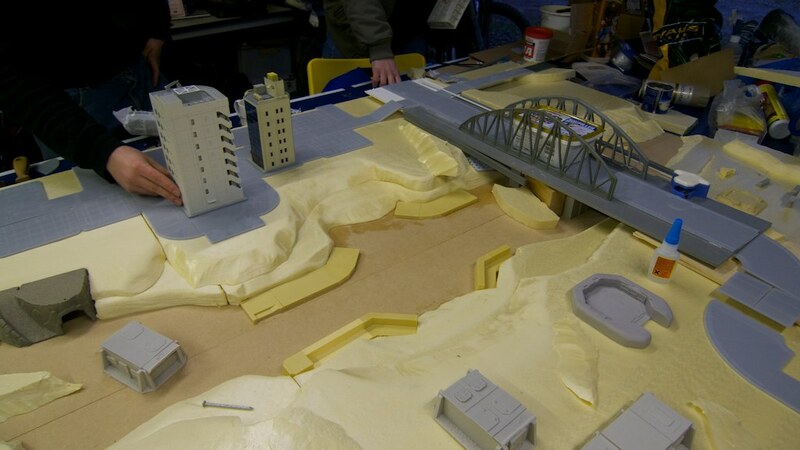 Last week we got the main foam board cut, sanded and glued down to the MDF boards on the 6ftx4ft terrain layout for the Salute Gruntz game 2011. The primary board design is based around a dry riverbed, dammed upstream. One side of the board is a mini-city or trade district and the other side is rougher and out of city limits. It is designed so that the dry riverbed will still be playable, rather than just being a great river divide. Making it playable avoids the issue of turning the board into a turkey shoot between both sides, so the bridge is not the only way across the terrain but still an important component. If you have ever played Battlefield2 Bad Company on the PS3, you may note that I am aiming for something like the Panama canal layout, which has a dry dock section in the middle which can be driven across by tanks. I don't have a million ton broken up tanker ship to drop on my layout, so I have opted for a bridge across the area rather than the ship. This coming week I will be confirming the city layout and sticking down the S6Engineering road and city plates. The bridge section is "drop on" terrain, so that the two 2ftx6ft board sections can be separated for transport and storage. The roads either side of the bridge will continue off the board with a slip road/ramp offering access. Some of the critical mass games 15mm building terrain will also be used to across the board as additional cover. Have a look at the flickr gallery for a range of photos of the WIP. Oath that looks like a great start to a gaming table! Where did you get the large multi storey buildings from? Looks great - I'd also like to know where you got those multi story buildings from!